With the move from analog to digital devices, new demands are being placed on the battery. Unlike analog equipment that draws a steady current, the digital mobile phone, for example, loads the battery with short, high current bursts. Increasingly, mobile communication devices are moving from voice only to multimedia which allows sending and receiving data, still pictures and even video. Such transmissions add to the bandwidth, which require several times the battery power compared to voice only. One of the urgent requirements of a battery for digital applications is low internal resistance. Measured in milliohms (mW), the internal resistance is the gatekeeper that, to a large extent, determines the runtime. The lower the resistance, the less restriction the battery encounters in delivering the needed power bursts. A high mW reading can trigger an early ‘low battery’ indication on a seemingly good battery because the available energy cannot be delivered in an appropriate manner. Figure 9-1 examines the major global mobile phone systems and compares peak power and peak current requirements. The systems are the AMP, GSM, TDMA and CDMA. Figure 9-1: Peak power requirements of popular global mobile phone systems. Moving from voice to multi-media requires several times the battery power. Some TDMA handsets feature dual mode (analog 800mA DC load; digital 1500mA pulsed load). Current varies with battery voltage; a 3.6V battery requires higher current than a 7.2V battery. Service technicians have been puzzled by the seemingly unpredictable battery behavior when powering digital equipment. With the switch from analog to digital wireless communications devices, particularly mobile phones, a battery that performs well on an analog device may show irrational behavior when used on a digital device. Testing these batteries with a battery analyzer produces normal capacity readings. Why then do some batteries fail prematurely on digital devices but not on analog? The overall energy requirement of a digital mobile phone is less than that of the analog equivalent, however, the battery must be capable of delivering high current pulses that are often several times that of the battery’s rating. Let’s look at the battery rating as expressed in C-rates. A 1C discharge of a battery rated at 500mAh is 500mA. In comparison, a 2C discharge of the same battery is 1000mA. A GSM phone powered by a 500mA battery that draws 1.5A pulses loads the battery with a whopping 3C discharge. A 3C rate discharge is fine for a battery with very low internal resistance. However, aging batteries, especially Li-ion and NiMH chemistries, pose a challenge because the mW readings of these batteries increase with use. Improved performance can be achieved by using a larger battery, also known as an extended pack. Somewhat bulkier and heavier, an extended pack offers a typical rating of about 1000mAh or roughly double that of the slim-line. In terms of C-rate, the 3C discharge is reduced to 1.5C when using a 1000mAh instead of a 500mAh battery. As part of ongoing research to find the best battery system for wireless devices, Cadex has performed life cycle tests on various battery systems. 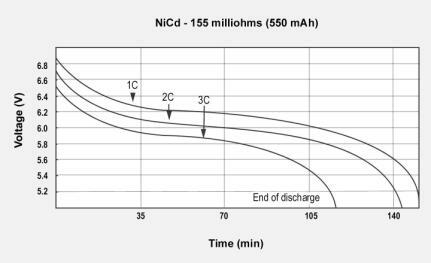 In Figure 9-2, Figure 9-3, and Figure 9-4, we examine NiCd, NiMH and Li-ion batteries, each of which generates a good capacity reading when tested with a battery analyzer but produce stunning differences on a pulsed discharge of 1C, 2C and 3C. These pulses simulate a GSM phone. Figure 9-2: Talk-time of a NiCd battery under the GSM load schedule. This battery has 113% capacity and 155m© internal resistance. A closer look reveals vast discrepancies in the m© measurements of the test batteries. In fact, these readings are typical of batteries that have been in use for a while. 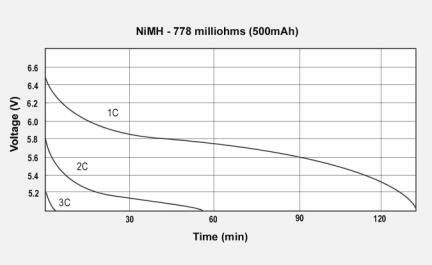 The NiCd shows 155mW, the NiMH 778mW and the Li-ion 320mW, although the capacities checked in at 113, 107 and 94 percent respectively when tested with the DC load of a battery analyzer. It should be noted that the internal resistance was low when the batteries were new. Figure 9-3: Talk-time of a NiMH battery under the GSM load schedule. This battery has 107% capacity and 778m© internal resistance. Figure 9-4: Talk-time of a Li-ion battery under the GSM load schedule. This battery has 94% capacity and 320m© internal resistance. From these charts we can see that the talk-time is in direct relationship with the battery’s internal resistance. The NiCd performs best and produces a talk time of 140 minutes at 1C and a long 120 minutes at 3C. In comparison, the NiMH is good for 140 minutes at 1C but fails at 3C. 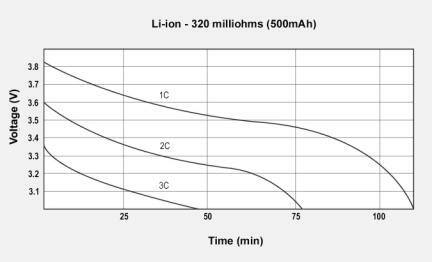 The Li-ion provides 105 minutes at 1C and 50 minutes at 3C discharge.